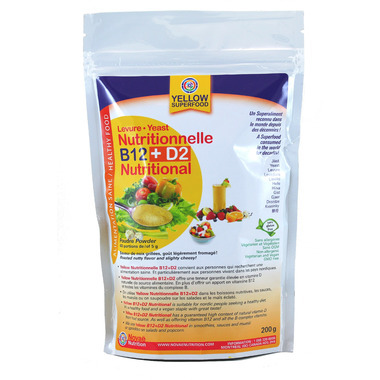 Yellow Superfood B12 + D2 Nutritional Yeast is a Superfood specially designed to provide vitamin D2, as well as all the B vitamins, including B12. It has a roasted nutty and slightly cheesy flavour. Use: Mix into smoothies, sauces, and muesli, or sprinkle on salads and popcorn. Ingredients: Yellow (Saccharomyces cerevisiae naturally enriched with vitamin D2). I love this product. The powder does great on popcorn! It tastes good, packed with vitamin B12 and good in sauces, dips, on popcorn... what else would a vegan want? Just starting into the vegan lifestyle and have been loving this product. Great for sauces or yummy sprinkled on popcorn. Very versatile. Great brand. I think I prefer the flakes but this works well in the dressings and dips. An essential part of my vegetarian diet! Doesn't taste good at all. But still has great benefits... I will not buy it again. Not sure what to make of this product - the texture was ok but did not like the taste and would have to really hide it in something to eliminate that. I think as an additive to a drink it would be fine.